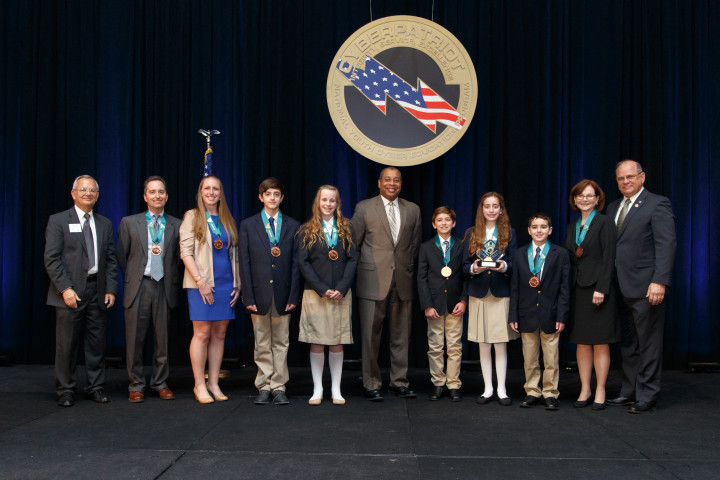 CyberPatriot is the premiere national youth cyber defense competition created to inspire middle and high school students toward careers in cyber security or other science, technology, engineering, and mathematics (STEM) disciplines critical to our nation's future. 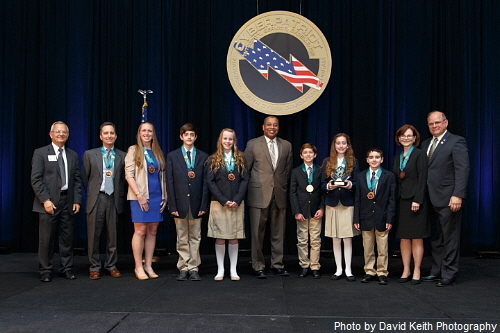 CyberPatriot is open to all middle and high schools and accredited home school programs. For more information and to enroll, go to: www.uscyberpatriot.org. As Coach, she brought Red Bank Regional High School CyberPatriot teams to the CyberPatriot (CP) VII, VIII, and IX Open Division National Finals the last 3 years, and the Maroon CP-IX Team was the number 2 or Runner Up Team out of over 2,200 teams. For the official team photo, see photo below. In 2011, she coached the CP-III Open Division Nation Championship Team and was recognized as the AFA Chapter 192 and NJ Teacher of the Year. Kyle Neary, Bobby Villaluz, Andrew Costa, Jack Ferrone, Jeremy Milonas. 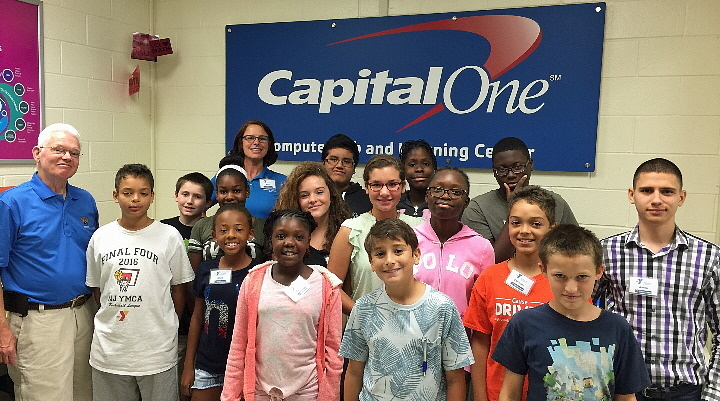 On Aug 1st, 2016, Howard Leach, VP of CyberPatriot visited the first day of CyberCamp at the Capital One Computer Lab at the East Orange YMCA, East Orange, NJ. It is one of two AFA CyberCamps being held in NJ. There were 14 Cyber-campers ages from 11 to 13 and one CAP Cadet. 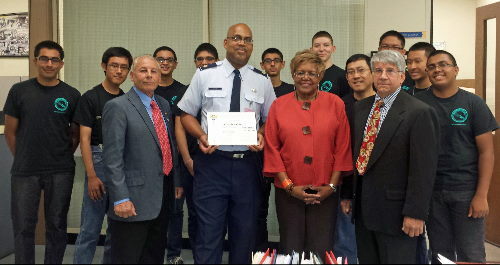 The CyberCamp sponsor, in back, was Alisa D. Vural, Chief Financial Officer, Metro YMCAs of the Oranges, and also Deputy Commander of Cadets for the Curtiss-Wright Squadron, CAP, Fairfield, NJ. On the right is Aaron Morales, former Cadet Commander, who along with Alisa Vural taught the camp and hope to have some new cadet members this year. Click here to see local Tap Into article on this CyberCamp. 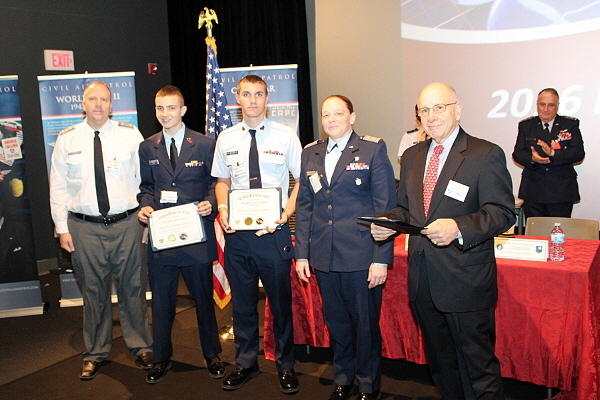 The McGuire Composite Squadron, CAP coaches and team members received their certificates from William M. Fosina, NJ President, at the NJ Wing CAP Conference, Liberty Science Center, April 16, 2016. Click here for info on the teams. 3rd Place Hola Hoboken team members with certificate. The CP VII competition was completed in March with the following NJ results. Overall, New Jersey had 48 teams registered and was the only State that had at least one team in each division within the finals. And NJ Middle School teams Markham Place teams 1 and 2 took the 2nd Place and 3rd Place Middle School National trophies respectively. Both teams were coached by Mandy Galante with assistance from other teachers. See below. Team Food Fighters of Markham Place School, Little Silver, NJ, accept the runner-up trophy at the CyberPatriot VII National Finals Competition. They were the first-ever all girls team to qualify for the National Finals. L-R: Bernie Skoch, CyberPatriot National Commissioner, Mandy Galante, coach, followed by teacher mentors and team members, Jeremy Milonas, teacher, and Scott Van Cleef, AFA Board Chairman on right. 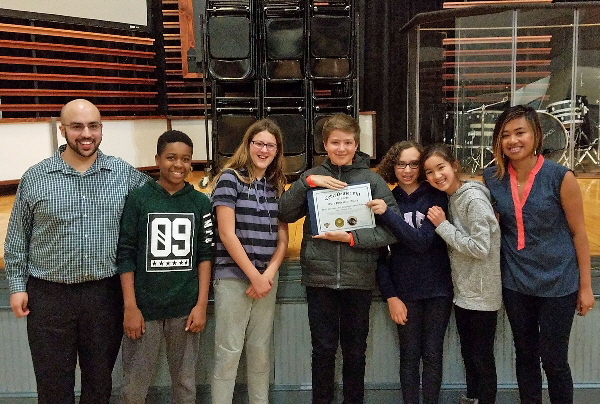 Team Flying Octopuses of Markham Place School accept the third place trophy at the CyberPatriot VII National Finals Competition. L-R: Bernie Skoch, CyberPatriot National Commissioner, followed by teacher mentors and team members, with Mandy Galante, coach, and Scott Van Cleef, AFA Board Chairman, on right. 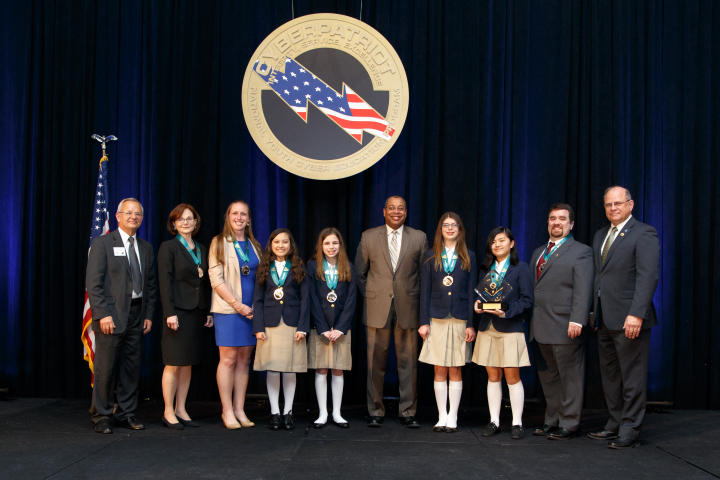 Check out the May 2014 issue of the CyberSentinel newsletter, p.3, Spotlight on the Most Improved Teams of CP-VI, Raritan Valley Composite Squadron, CyberRavens (New Jersey). 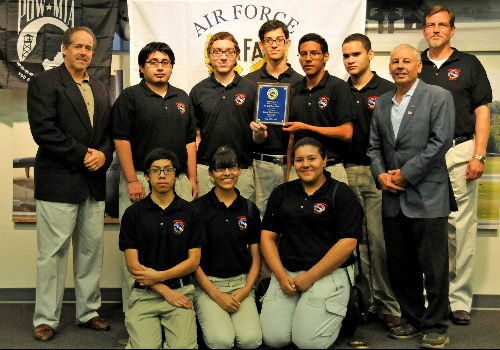 At the NJ AFA Convention at Joint Base McGuire-Dix-Lakehurst on July 26th, 2014 the Raritan Valley Composite Squadron, CAP, CyberEagles team was recognized for their CyberPatriot VI NJ first place finish and Most Improved team in the All Service Division. L-R: Maxine Rauch,NE Region President, Cadets SSgt Garrett Leung, MSgt Trevor Shu, 2d Lt James Case, Howard Leach, NJ President, AFA, and Lt Col Amy Myzie, Commander, Raritan Valley Composite Squadron, Civil Air Patrol. Additional team member Cadet TSgt Heli Patel and Coach Capt Jaysin Maskarenas are not shown. 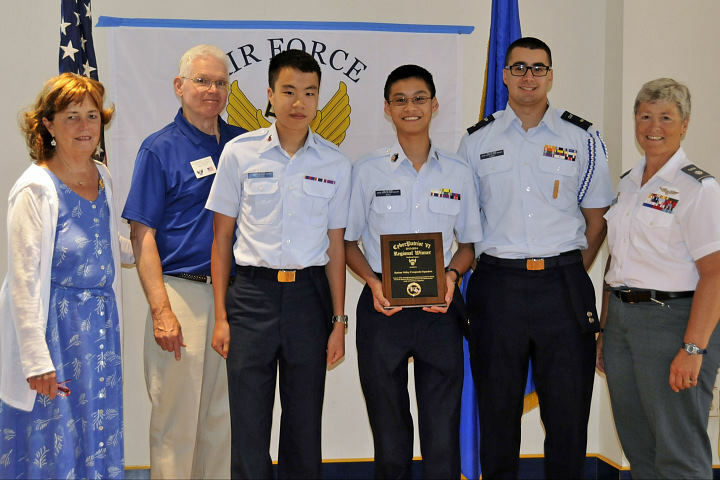 At the NJ Air Force Association's Convention at Joint Base McGuire-Dix-Lakehurst on July 26th, 2014, the Raritan Valley Composite Squadron, CAP, CyberEagles team was recognized for their CyberPatriot VI NJ first place finish in the All Service. Back L-R: Maxine Rauch,NE Region President, Cadet 2d Lt Vatsal Patel, Cadet CMSgt Jordan Daley, Howard Leach, NJ President, and Lt Col Amy Myzie, Commander, Raritan Valley Composite Squadron, Civil Air Patrol. Additional team member Cadet SSgt Arvind Ramakrishnan and coach Capt Jaysin Maskarenas are not shown. On April 10th, 2014, the Randolph High School – Red Team receive the CyberPatriot-VI, Open Division, NJ 1st Place Award Certificate. Front L-R: Howard Leach, NJ President; Andrew Putlock; Sally Snelson, Coach; Debbie Iosso, Principal; William Fosina, 195 President; and Roslyn Franklin, Assisting Coach. Back L-R:, Issac Loo; Ethan Sterk; Daniel Rios; Steven Cheng; Kevin Butryn; Brian McDevitt; Patrick Gannon; and Michael Cascione, STEM Supervisor. On April 10th, 2014, the Randolph High School – Blue Team receive the CyberPatriot-VI NJ 2nd Place Award Certificate. Front Row L to R: Samuel Wasserman; Sally Snelson, Coach; Debbie Iosso, Principal; William Fosina, 195 President; Kyna Horten; and Roslyn Franklin, Assisting Coach. Back Row L to R: Howard Leach, NJ President; Joel Kurian; Christopher Maxwell; Jamie Flynn; Joe Michail; and Michael Cascione, STEM Supervisor. 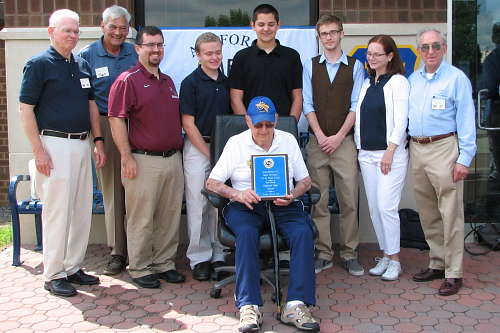 On Sept 26, 2013, Maj. Charles Taylor, USAF, ret., the officer in charge of the AF JROTC NJ-761, and the CyberPatriot V team coach, was presented with his 2013 AFA NJ State Teacher of the Year award. On hand to congratulate him were the following at the Piscataway High School, Piscataway, NJ. Shown in front L-R, are Joseph Capriglione, 190 President, Maj. Charles Taylor, USAF, ret., Elaine P. Davis, Intern Principal, Hanz Makmur, team Mentor, and Martin Capriglione, 190 Secretary/Treasurer. Also, L-R in back, are the NJ 1st Place All Service Division CyberPatriot team members: Sagar, Matthew, Kaval, Harshel, Shivang, Nikolai, Daryll, Michael, and Abhishek. 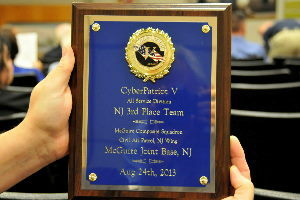 On August 24th at NJ AFA Convention at McGuire Joint Base, the Passaic High School Navy JROTC CyberPatriot V team was recognized for their second place finish within the 24 teams in the All Service Division in New Jersey. The award plague was presented by Anthony Devino, VP, on left, and Joseph Capriglione, President, on right, of the Sal Capriglione Chapter 190, Air Force Association. Front row L to R: Jesus Reyes, Mariana Cotzomi, Gabriela Hernandez. Back row L to R: Anthony Devino, 190 VP, Glend Lopez, Christopher Cancel, Leandro Villar, Mario Guerrero, Rafy Reyes, Joe Capriglione, 190 Pres, and James Nuyen, NJROTC Instructor. Above, Lt Col Michael Sperry, CAP, Chief of Staff, NJ Wing Civil Air Patrol, Joint Base McGuire-Dix-Lakehurst, receives the McGuire Composite Squadron, CAP, CyberPatriot V team plaque for their third place finish within the 24 teams in the All Service Division in New Jersey. The CyberPatriot V New Jersey team winners are as follows. First place is the Piscataway High School Air Force JROTC, Piscataway, NJ. This is their second First Place finish with coach Major Charles Taylor, USAF, ret. Second place is the Passaic High School NJROTC, Passaic, NJ, with coach James Nuyen, AT1 (AW/NAC), USN, Ret. 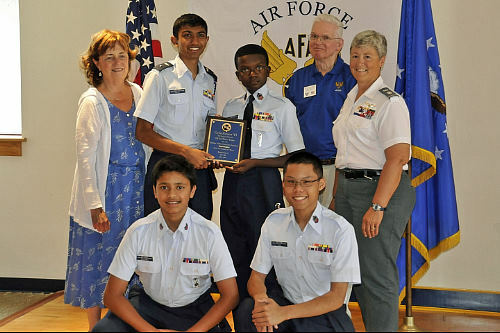 Third place is the Civil Air Patrol McGuire Composite Squadron, McGuire Joint Base, with Edward Williams as coach. First place is again Red Bank Regional High School, Little Silver, with Amanda Galante as coach. They went all the way in the CP-III competition and won the National Open Division Championship and took home the President's Trophy in 2011. Second place is the Montgomery High School, located in Skillman, NJ, with Dana Newbury as coach. At the last AFA New Jersey State Convention, held Saturday,18 August 2012, at Joint Base McGuire-Dix-Lakehurst, NJ, sponsored by Chapter 360, the following AFA NJ State CyberPatriot IV Awards were presented. CPIV NJ All Service Div Champs – L-R: Michael Makmur, David Le, Major Charles Taylor, USAF ret. 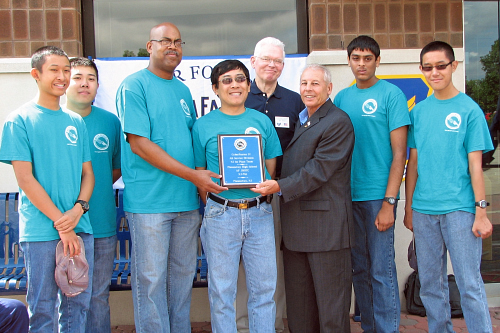 (coach), Hanz Makmur (mentor), Howard Leach, AFA NJ Pres, Joseph Capriglione, AFA 190 Past Pres, Sunny Patel, and Matthew Makmur. In addition to those shown above, the following additional team members were unable to attend: Harshel Patel, Sagar Patel, Shivang Pandya, and Kaval Patel. L-R Back: Howard Leach, AFA NJ Pres, David 'Buck' Buckwalter, Ex VP and Acting Pres AFA, teacher Jeremy Milonas, Ryan McVeety, Michael Terpak, Alec Jasanovsky, Amanda Galante (coach/teacher), and Eric Taylor, NE Region Pres. Front: Dominick Mullaney, President of the AFA 192- Hangar One Chapter. The Red Bank High School's CyberPatriot IV team was recognized for their first place finish in New Jersey over 11 other teams. In addition to those team members shown above, the following additional team members were unable to attend: Jared Katzman, Luke Matarazzo and Richard Connors. In addition to the NJ 1st place win, they were the only NJ team to qualify for the 3rd round of competition. 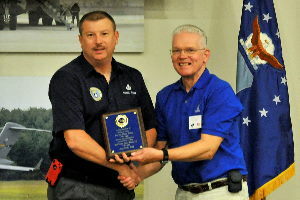 The award plaque which contains a CyberPatriot IV coin, unique to each yearly competition was presented by Dominick Mullaney, front, President of the AFA 192- Hangar One Chapter.